Please join us for A Conversation with William Finnegan, as the author discusses his latest work, the Pulitzer Prize-winning book, Barbarian Days: A Surfing Life. Finnegan will read from his memoir, followed by an interview led by Scott Korb, Director of the First Year Writing program. Journalist William Finnegan has been a contributor to "The New Yorker" since 1984 and a staff writer since 1987. Reporting from Africa, Central America, South America, Europe, the Balkans, and Australia, as well as from the United States, he has twice received the John Bartlow Martin Award for Public Interest Magazine Journalism and twice been a National Magazine Award finalist. Finnegan is the author of five books: Crossing the Line, which was selected by "The New York Times Book Review" as one of the ten best nonfiction books of the year; Dateline Soweto; A Complicated War; Cold New World: Growing Up in a Harder Country, which was a finalist for the Helen Bernstein Book Award for Excellence in Journalism; and Barbarian Days: A Surfing Life. Scott Korb is the author of Light Without Fire: The Making of America's First Muslim College, Life in Year One: What the World Was Like in First-Century Palestine and coauthor of The Faith Between Us. He teaches at the New School and at New York University and is on the MFA faculty at Pacific University. Food and catering will be provided. 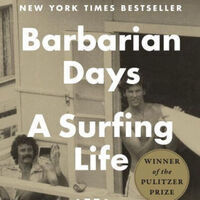 Copies of Barbarian Days: A Surfing Life will be available for purchase, courtesy of Posman Books. Presented by First Year Writing and Eugene Lang College.